Dental implants are today's state-of-the-art tooth replacement method. They consist of a very small titanium implant post (the actual implant), which is attached to a lifelike dental crown. The crown is the only part of this tooth-replacement implanting system that is visible in your mouth. 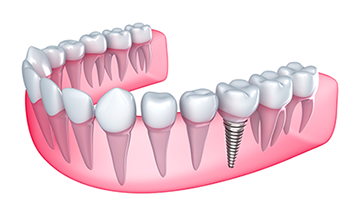 The dental implant itself rests beneath your gum line in the bony socket that used to hold your missing tooth. Two, four or more dentist implants can be used to support multiple crowns, or even an entire arch of upper or lower replacement teeth. Whether you are missing one tooth, several teeth or all your teeth, dental implants are preferred by doctors and patients alike. That's because dental implants are safe, affordable, effective, and similar to natural teeth. Please contact our dental practice in Winnipeg, Manitoba, CA for more detailed information on dental implants and to request an appointment! Your natural teeth have roots that keep them securely anchored to your jawbone. In a similar way, implant dentistry teeth form a solid attachment with the bone in your jaw. This is possible because dental implants are made of titanium, a metal that has a unique ability to fuse to living bone. After a dental implant is inserted during a dental implant surgery procedure done in your dental office, it will become solidly fused to your bone over a period of several months. Once that happens, your implant-supported replacement tooth (or teeth) will feel completely natural. It will also be visually indistinguishable from your natural teeth. Implanted teeth allow you to eat, speak and smile with complete confidence because they will never slip or shift like removable dentures often do. Because dental implants actually become part of your jawbone, they provide a permanent solution to tooth loss. Whereas other methods of tooth replacement, including removable dentures and bridgework, may need to be replaced or remade over time, properly cared-for dental implants should last a lifetime. That's what makes this choice of tooth replacement through implant dentistry the best long-term value. You may not know it, but bone loss inevitably follows tooth loss. Bone is a living tissue that needs constant stimulation to rebuild itself and stay healthy. In the case of your jawbone, that stimulation comes from the teeth. When even one tooth is lost, the bone beneath it begins to resorb, or melt away. This is where a dental implant procedure could help. 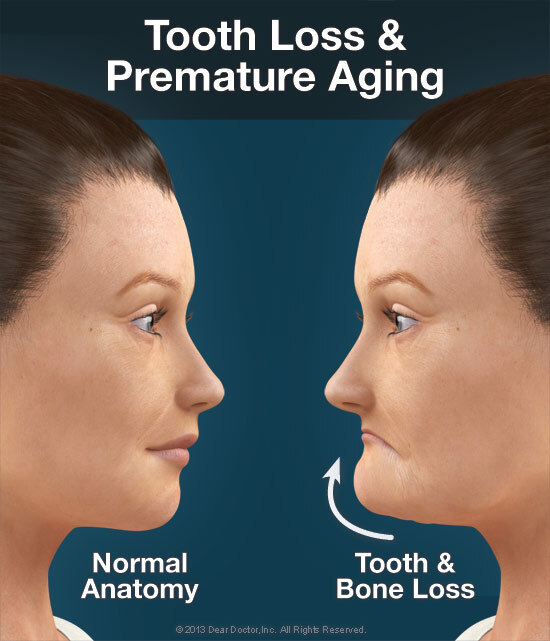 Tooth loss can give your face a prematurely aged appearance and even leave your jaw more vulnerable to fractures if left untreated long enough (View Example). Dental implants halt this process by fusing to the jawbone and stabilizing it. No other tooth replacement method can offer this advantage. Dental implants have no effect on the health of adjacent natural teeth; other tooth-replacement systems, however, can weaken adjacent teeth. With bridgework, for example, the natural teeth on either side of a gap left by a missing tooth must provide support for the dental bridge. This can stress those adjacent teeth and leave them more susceptible to decay. Likewise, a partial denture relies on adjacent natural teeth for support and may cause those teeth to loosen over time. Full dental implants are stand-alone tooth replacements that don't rely on support from adjacent natural teeth. Caring for dentist implanted teeth is no different than caring for your natural teeth. You must brush them and floss them daily. But you'll never have to apply special creams and adhesives, or soak them in a glass overnight, as you would with dentures. They'll also never need a filling or a root canal, as the natural teeth supporting bridgework might. While full and mini dental implants can never decay, they can be compromised by gum disease. Good oral hygiene and regular visits to the dental office for professional cleanings and exams is the best way to prevent gum disease, and to ensure your dental implants last a lifetime, as they're designed to do. 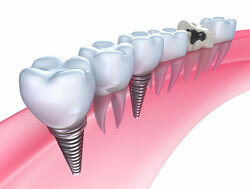 For more information on Dental Implants in the Winnipeg, Manitoba area call Dental Designs today!